We use this for picking orders in the warehouse. It is wonderful designed. There is also a nice built in tray to put smaller items. It can be dusty in the warehouse, but the shelves are easy to wipe clean. 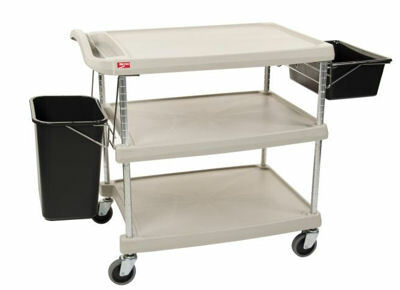 Metro's MY1627-34G 3 shelf with swivel/resilent tread casters is designed for a wide variety of applications. They have smooth surfaces to resist staining and wipe clean easily. Shelves are corrosion-proof with a 7/16" lip around shelf perimeter to contain spills. Aesthetically these shelves are quite attractive which allow for use in a variety of applications. myCart series is easy to adjust with no tool assembly. Each shelf can hold up to 150 lbs and offers 16" x 27" of flat space with a max of 400 lbs per unit. 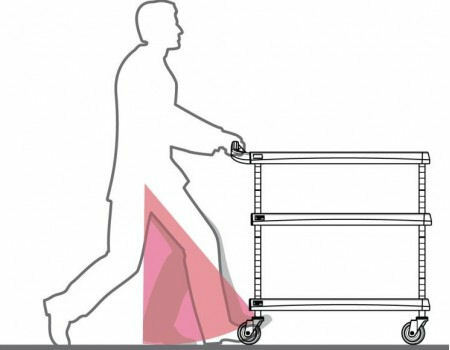 Metro myCarts are designed for maximum user comfort, boasting a unique cart design that offers 50% more legroom than conventional cart styles, reducing painful shin bumps and accidental kicks to the bottom shelf. 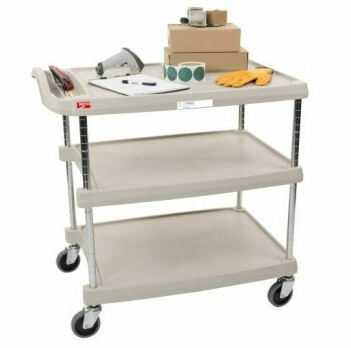 Plus, an easy-grip handle offers great control when steering, and the built in utility tray is a convenient spot to place personal items when using the cart. For additional convenience, the center shelf may be adjusted on 1" increments. Shelves are supported by four chrome posts and four, 5" swiveling resilient rubber casters provide smooth mobility. Easy to assemble, it requires no tools and is NSF Listed. 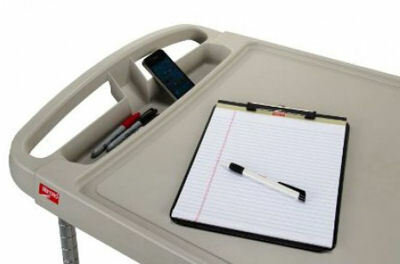 Ergonomic handle and roomy utility tray. Easy, No-Tool Assembly: Ships knocked down.